I was asked to make memory quilts from shirts of a friends father who passed away. Thank you to everyone for your input when I hesitating on which way to go. Great way to use the shirts! Handsome quilt top and neat use of plaids and stripes! Oh, I think you did a great job! Wow! Wonderful quilt! I'm sure it will be treasured! 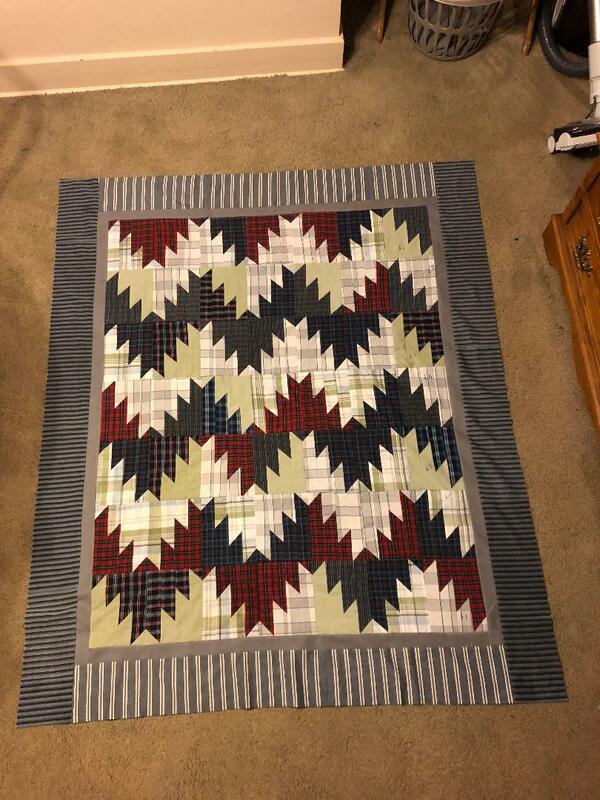 As for suggestions for quilt #2... I am sure you'll find another great pattern. ... or maybe decide to use the same pattern with different colored shirts. Be sure to show us pictures of it when it's finished! That's so striking! You did a great job. Seems like you've been making a lot of memory quilts lately! Terrific finish to this quilt top. Great pattern too. Some people know how to put a blessing into any situation! Your choice of quilt pattern is just perfect to show off a nice collection of shirts. It is one of the best memory quilts I have ever seen. I will be anxious to see the second one. What a wonderful memory quilt! Looking forward to seeing the next! You should be happy - this is a beautiful quilt! Great choice of design pattern for a memory quilt. Good job.